such an interesting bunch of studies the last couple of days, all instigated by something neil asked in the comments section of 'women and nature.' he wanted to know about the connections that may have brought elizabeth keith to the attention of watanabe shozaburo. as it turns out, nobody had to have much in the way of connections to meet watanabe -- he was on the prowl. he pursued artists, western and japanese, by attending exhibitions, and by making himself known. i just updated the labels on my library thing today; sometimes it surprises me how long i have been at this, and to what degree i haven't even known what i was looking at. so let's look again at watanabe, though it's true, we have met him before (and here too). because what this is all about is 'shin hanga,' and what shin hanga was all about was watanabe. but first let's remind ourselves of the state of printmaking in japan at that time: the 'invasion' was nearly 50 years earlier; ukiyo-e had fallen out of fashion as painters from japan travelled to paris to study with matisse and monet. those left in japan with their printmaking skills had taken to producing pull-out illustrations for paperback novels. ukiyo-e was edo, and edo was over. "Out of this general decline, a new art movement was born -- the shin hanga ("new prints") movement .... The concept of shin hanga was traditional and Japanese. The dogma was to keep the old way of creating a woodblock print in a highly specialized team of artist, carver, printer and publisher. In this team the artist made the design and at best supervised the work of the carvers and printers. The publisher was responsible for sales and the commercial success. "In such a team the publisher was usually the decision maker. He had to pay the artist, the carvers and printers, and thus was geared for commercial success. The carvers and printers were on the lower side of appreciation and received less money for their work than the artist. However, in our view they were the ones with the highest degree of artisan skill. "These shin hanga teams added some modern Western features to traditional Japanese subjects. The essential feature was the use of light and shadow. The Japanese had learned this from the French impressionists. Another Western feature was perspective. The third and probably decisive factor for shin hanga was their sales concept. It was catered from the beginning for export of the prints to North America and Europe. In plain words, the prints were designed and created in a way that should please foreigners. Shin hanga images show beautiful landscapes with an intact nature, geishas in kimonos on their way home under a full moon, fishing boats sailing under a red sky, and above all that majestic Mount Fuji in the background. Critics of shin hanga come up with the reproach that the world shown on shin hanga images was one that had ceased to exist a long time ago. 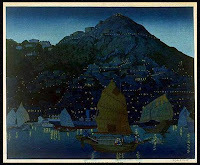 "Shin hanga was not an art movement founded by a group of artists. When we speak of shin hanga we must mention one man -- Shozaburo Watanabe, 1885-1962. He was everything for shin hanga: the founder, the driving force and mentor of the movement. At a very young age Mr. Shozaburo Watanabe had established his own print shop. In the beginning his core business was the production of reproductions that he exported to the U.S.A and Europe. he would follow through this process, visiting exhibitions, then soliciting the western artists to work with him, with numerous others. not all works published in this way was of scenes in japan; elizabeth keith and cyrus baldridge, for example, were more likely to paint scenes from china than of japan. in addition to capelari, there were also bertha lum and charles bartlett. additional japanese artists to work with watanabe were yoshida hiroshige, kawase hasui, ohara koson, goyo, and many others. the artists brought him paintings, and he made magic of them. do i care do i feel 'duped'? well, maybe for a second or two. then i life my eyes, to shotei, or kawase, or keith, and i am enwrapped in awe once again. Well, this is too much to take in at once, I'll have to come back. But what an untold story you have unravelled here. I hadn't even realised Watanabe was a publisher not a printmaker. The whole business of selling the east to the west, and the west to the east, has never been properly examined. But you're right - the influence of commercial motives on the arts is not necessarily detrimental - what matters is the end result. If the art is honest, it will speak and live. i know! it took me reading this stuff (online and in my books) a number of times till it took form in my head. it keeps striking me how all this stuff has been right before my eyes for so many years and only now are they coming into focus. and yes, i have this wonderful shin hanga book, and another that includes a large section on it; i remember a shop here in berkeley that sold prints of the yoshidas and i'd go there over and over and drool over them. i even have the book of hiroshi yoshida's complete work. and the most recently obtained of these books was maybe 15 years ago! and yet i think watanabe was right, i wanted to believe that japan was like that -- at least then. what watanabe knew was that we in the west had never had what japan was losing, and that every soul needs to know it, if even at a distance. once again, you have opened up new spaces in my mind, filling them with wonders and images that i knew nothing of .... yes, i love these beautiful prints; have always found myself drawn to them - but alas, have never felt the urge to understand the 'process and intent' of their creation. what you have done here is so beautifully succinct. i believe i could attend a gathering and speak half-convincingly on the subject thanks to your research and clarity. you are so generous and kind, ms bb. i'm delighted to hear it was that clear! now, what do you teach? After Christmas ?? job hunting commences. I do hope for language arts, but those positions are rare. i *still remember* my 8th grade ap english class -- even specific assignments! well, and for job searches -- you never know. i have a feeling you can make magic happen. LINK - snow scenes "attributed" to Watanabe which, now that I've read your informative post, means very little I suppose. They are beautiful nevertheless. but the second part of your comment--that i can agree with and thank you.